Herb-roasted chicken and creamy polenta? Yes, please! 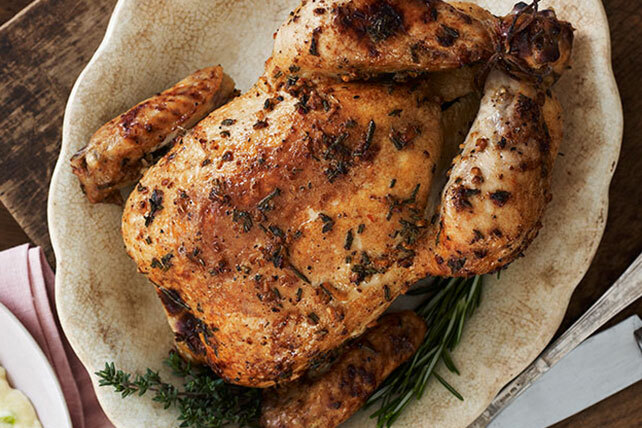 Quick, easy and delicious, our Herb-Roasted Chicken & Polenta dish has a prep time of just 10 minutes. Mix first 5 ingredients; brush over chicken in 13x9-inch baking dish. Bake 1-1/2 hours or until chicken is done (165°F), basting occasionally with juices in bottom of baking dish. Remove from oven; cover. Set aside. Bring milk just to boil in saucepan on medium heat, stirring occasionally. Graually add cornmeal, whisking constantly; cook and stir on low heat 5 min. Add cheese and onions; cook 2 to 3 min. or until cheese is melted, stirring constantly. Spoon onto platter. Top with chicken. Serve with a crisp mixed green salad tossed with your favorite KRAFT Light Dressing to round out the meal. Prepare using KRAFT Shredded Three Cheese with a TOUCH OF PHILADELPHIA.